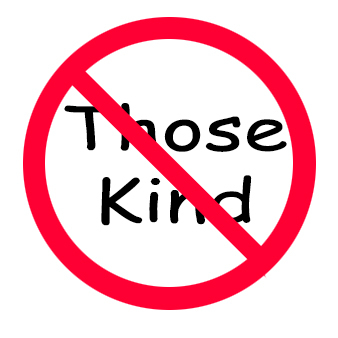 “those” is plural”; “kind” is singular. They do not match. Say “that kind” or “those kinds.” Then you have a match, either singular with singular, or plural with plural. What is hard about this is understanding why anyone should insist on saying (and writing!) incorrectly on this point. It should be very simple, even to the very simple. While we’re on the subject, think about what the (correct) plural version really means: “They were one of those kinds of teams,” or “It’s nice to play those kinds of games,” or “I’m one of those kinds of people.” How many “kinds” are there? “Kind” refers to a type, species, class or category. How many “kinds” did that team, or game, or person really represent? One: the “kind” that you were talking about. So please, use the singular. The plural makes little sense. I believe that those who say “kinds” really started of to say “those kind,” but caught themselves and then recovered by adding an afterthought “s” to the noun. Make life easy for yourself: Develop the habit of saying “this kind” or “that kind,” and you’re done. Next Next post: May I? Can I? Shall I? Will I?